In addition, according to the American Journal of Clinical Nutrition, Vitamin D deficiency is now recognized not only as an American problem but as a global pandemic as well. The National Institutes of Health (NIH) reports that overall vitamin D deficiency in the U.S. is 42%. The highest deficiency rates were seen in African Americans at 82% and Hispanics at 69%. Aging, medications and medical conditions, menstruation, poor or very strict diets, and heavy alcohol consumption can all contribute to nutrient deficiencies. To correct a vitamin or mineral deficiency, you must first recognize that nutrients work synergistically. There are more than 45 currently known essential nutrients and all have interactions with other nutrients. This means that there is cooperation or harmony between certain vitamins and minerals that work as catalysts to promote assimilation and absorption of other vitamins and minerals, which in turn promotes health. In other words, you can’t simply replace a single nutrient deficiency without taking a balanced multiple vitamin and mineral formula. Synergy is fundamental to optimal nutrition because nutrients interact and are dependent upon one another to promote optimal health by regulating body processes, building, repairing and maintaining body tissues and furnishing the fuel necessary for energy production. These functions are all nutrient specific. Since the body doesn’t use substitutes when there are nutrient deficiencies, a balanced diet containing all nutrients is necessary. When nutritionists speak about a healthy diet, they are referring to fresh, live, unprocessed, whole foods in their natural state, which contain hundreds of health promoting nutrients. Some examples of nutrients that work synergistically include vitamin D, which assists calcium absorption, potassium, which helps the kidneys eliminate excess sodium, B12 and folate, which work together to support cell division and replication, and zinc, which enables the body to use vitamin A. While some nutrients need to be replenished daily and some can be stored by the body for later use, it’s not enough to simply “get a lot” of fruits and vegetables in your daily diet. For optimal nutrition you also need to make sure there is balance and biodiversity among the food groups. Many of us eat the same 30 foods routinely and generally cycle through all them in just 4 days. It’s important to have as much diversity within the food groups as possible. Nutritional supplements can help ensure that dietary needs are not just met but maximized to support good health and lower the risk of developing age related chronic disease. By contrast, RDA guidelines list minimal daily amounts necessary to avoid deficiencies. Taking supplements with a meal (unless recommended otherwise) aids in assimilation, as together the natural digestive process and natural food nutrients help to promote the digestion and absorption of all the nutrients from both the supplement and the food. Enzyme Nutrition Two Daily Multi-Vitamin by Enzymedica – This 100% whole food matrix is powered by Thera-Blend™, a superior enzyme blend designed to enhance the utilization of vitamins and minerals. This easily digestible formula also contains nutrient-rich superfoods, botanicals, antioxidants and guaranteed potency, shelf stable probiotics. Suitable for all, 14 years of age and older. Gluten, soy and dairy free, Non-GMO formula. Specialized Men’s and Women’s formulas also available. PhytoMulti Capsules by Metagenics – This science-based formula contains a highly concentrated proprietary blend of full spectrum phytonutrients along with essential vitamins and minerals for optimal multidimensional health support. Gluten free, Non-GMO formula. UltraNutrient by Pure Encapsulations – This product combines core vitamins and minerals with advanced antioxidants and standardized phytonutrient extracts to provide broad spectrum nutritional support for the whole body with emphasis on cardiovascular and liver health. Twice Daily Multi by Designs for Health – This formula contains optimal amounts of foundational nutrients and includes vitamins and chelated minerals in therapeutic doses. Posted on December 10, 2014 | Comments Off on Does Your Diet Deliver? Vitamins and minerals, so vital to human health, are a constant source of deliberation when it comes to supplementation. While many would agree that a daily multivitamin is a great nutritional insurance policy, others would claim a healthy diet is all we need. However, telling people to simply “eat healthy” may actually be doing the population a disservice, as studies show that nine in ten Americans may falsely believe they are following a healthy and nutritious diet plan. While Americans tend to give themselves high marks for healthy eating, the reality is that the state of the health of Americans says otherwise. One in three American adults is obese, only one-fourth report limiting sugar and harmful fats, and fully two-thirds admit they don’t eat the recommended amounts of fruits and vegetables daily. In fact, the modern diet, which consists largely of processed foods loaded with sugar, refined flour and processed vegetable oils, is the main reason behind the obesity epidemic and the spike in chronic diseases including heart disease, stroke, cancer, diabetes, osteoarthritis, fatty liver syndrome and other health conditions. According to the USDA, Americans spend only 0.05% of their food budget on green vegetables, while spending 17% on refined grains, 13% on sugars and sweets and 9% on frozen prepared foods. Clearly, consumers are making choices that are totally out of sync with federally recommended guidelines. As American dietary budgets move in the direction of higher expenditures on prepackaged and processed foods, fruit and vegetable consumption decreases, along with vitamin and mineral intake. Along with our nutrient poor choices comes a diet totally out of balance with the vitamins, minerals, healthy fats, fiber and phytonutrients necessary for optimal function and wellness. While there is little doubt that a refrigerator well stocked with nutrient dense whole foods is the first line of defense for staying healthy, the ever increasing consumption of fabricated nutritionally void products may make its own case for the need for supplementation of essential micronutrients. Simply put, Americans are not eating healthy enough diets to provide optimal levels of a range of vitamins, minerals and nutrients. Other factors such as aging, medical conditions, genes and certain unhealthy lifestyle habits can also contribute to vitamin deficiencies. Aging- Mild vitamin and mineral deficiencies are common among seniors and are associated with anemia, cognitive impairment, poor wound healing and a vulnerability to infections. Vitamin deficiencies can include vitamin B12, folic acid, vitamin C and vitamin D. Mineral deficiencies can include calcium, zinc and magnesium. The causes are varied and are believed to include malabsorption issues, decreased appetite, poor nutrition and prescription medications. Age related changes that can affect vitamin and mineral deficiencies may also include the increased presence of hormones that decrease appetite, along with the decreased presence of the neurotransmitters that stimulate appetite. Medical conditions – Certain medical conditions can block the absorption of vitamins and minerals from foods. Inflammation, infections, gastric disorders, diabetes and even certain cardiovascular conditions may result in malabsorption of calcium and vitamins B12, E, K and D. Proteins, carbohydrates and electrolytes may be poorly absorbed as well. Alcohol consumption- Consuming even moderate amounts of alcohol on a regular basis can cause a folic acid deficiency. Alcohol can inhibit the absorption of nutrients by decreasing the secretion of pancreatic digestive enzymes and by damaging the cells that line the stomach and the intestines. Alcohol inhibits the absorption of fats and as a result negatively affects the absorption of fat soluble vitamins A, E and D. Common mineral deficiencies can include calcium, magnesium, iron and zinc. Chronic heavy drinking is linked to vitamin and mineral deficiencies as a result of decreased food intake and, for some, impaired absorption, metabolism and utilization of nutrients. 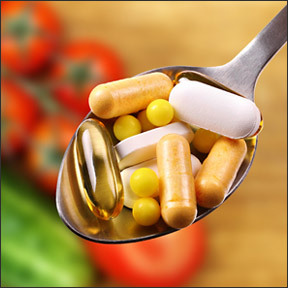 Medications – Both prescription and OTC medications can cause nutritional deficiencies. These include cholesterol lowering drugs, diabetes medications, oral contraceptives, anti-inflammatories, blood pressure medications, acid blockers and antibiotics among others. B vitamins, CoQ10, folic acid, vitamins C and D, and the minerals magnesium, calcium, iron, selenium, and zinc are all examples of deficiencies that can occur when taking medications. It may help to remember that nutrients work synergistically to support biochemical processes. 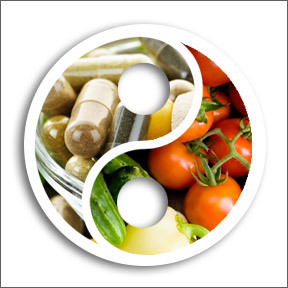 Basic science supports the use of nutritional supplements in disease prevention and the strive for optimal health. While Americans continue to be overfed and undernourished, you can take action to protect your own health by eliminating the processed foods that drive disease, eating more nutritious whole foods, getting regular exercise and taking your recommended daily dose of good quality multivitamins, vitamin D and omega-3 essential fatty acids. Enzyme Nutrition Two Daily Multi-Vitamin by Enzymedica – This 100% whole food matrix contains guaranteed potency probiotics along with nutrient rich superfoods and daily botanicals. Non-GMO, gluten and soy free and suitable for everyone aged 14 and older. ProOmega D 1000 mg by Nordic Naturals – This exceptional product contains 1,000 I.U. of vitamin D along with high levels of pure, ultra-fresh omega-3 essential fatty acids in support of cardiac, immune, neurological and eye health. Produced in Norway from deep sea fish and third party tested for environmental toxins and heavy metals. Non-GMO and gluten free formula. Bio-Multi Plus Iron Free by Biotics Research – This versatile and balanced multiple vitamin and mineral formula supplies unique forms of micronutrients along with bioflavonoids and CoQ10. Gluten free formula. UltraNutrient by Pure Encapsulations – This high potency advanced formula provides core vitamins and minerals along with antioxidants and standardized phytonutrient extracts in support of cardiovascular, liver and overall health. Gluten and soy free formula. Comments Off on Does Your Diet Deliver? The times they are a-changing. High carb-low fat diets are out. Low carb-high fat diets are in. Although low carb-high fat diets have been controversial for years, studies show that a low carb-high fat diet leads to weight loss and lowers risk factors for metabolic syndrome, which is associated with chronic diseases. A ketogenic diet involves a shifting of your body’s metabolic processes from burning carbohydrates (glucose) for fuel to burning fats instead. This metabolic state is called nutritional ketosis, which simply means that your body cells are burning fat fragments, known as ketones, as opposed to glucose. Not to be confused with ketoacidosis, a condition often associated with type 1 diabetes and insulin dependent type 2 diabetes, nutritional ketosis results from a controlled insulin regulated process in response to a lower carb and higher fat dietary intake. Some of the controversy surrounding the ketogenic diet stems from confusing diabetic ketoacidosis with nutritional ketosis. Insulin dependent diabetics produce ketones when they don’t have enough insulin for the body cells to utilize the glucose in their blood streams. To prevent the body from entering starvation mode, the diabetic body can overproduce ketones, which can lead to critical illness. However, those on the low carb-high fat diet, who produce insulin normally, become keto-adapted. Our livers naturally produce ketones from fats and certain amino acids in order to feed our brains, which can only function with glucose and ketones. Ketosis is the metabolic process of burning your own body fat for fuel, which is regulated by the insulin levels within the body. What happens when your body is in the state of ketosis? Your appetite is naturally reduced. Many of us give up on dieting simply because we get hungry. When we reduce our consumption of refined carbohydrates, like bagels, chips and sweet treats that raise blood sugar, and increase our consumption of healthy fats such as nuts, avocados and olive and coconut oils, it eliminates the cyclical sugar craving cycle, leaving us more satiated and with more stable blood sugar. Fats are not the enemy. And in fact, we need more healthy fats. Fats are necessary to absorb vitamins, minerals and antioxidants. They help build cell membranes and supply energy. Healthy fats, such as omega-3 fats, reduce inflammation and the risks of obesity, arthritis, depression and heart disease. Fats don’t raise blood glucose levels and since they don’t solicit an insulin response, they can’t be stored as body fat. Your body goes into a fat burning state as opposed to a sugar burning state. With a high carb diet, which creates and burns glucose, a steady supply of carbohydrates is needed to keep energy levels up. When more carbs are eaten to satisfy hunger, excess glucose is converted and stored as fat, leaving your body little chance to access and burn stored fat. To effectively lose weight, our bodies must burn stored fat. A large percentage of body fat that is lost on low carb-high fat diets is visceral fat, dangerous belly fat that accumulates around body organs. Belly fat drives inflammation and creates insulin resistance, which can lead to metabolic syndrome, heart disease and type 2 diabetes. Low calorie-low fat diets essentially starve your body. The ketogenic diet is not calorie controlled, so you don’t have to go hungry. Higher fat diets satisfy hunger so you tend to eat less. A refined carb-low fat diet keeps you in sugar burning mode, while a low carb-high fat diet puts you in fat burning mode. Eliminating excess sugar and refined carbs reawakens the body’s ability to use ketones as fuel. As your body becomes more efficient at burning fats for energy, blood sugar is stabilized. With a diet of refined carbs, insulin levels are increased along with the body’s resistance to insulin. The high carb-low fat diet encourages fat storage, not fat utilization. 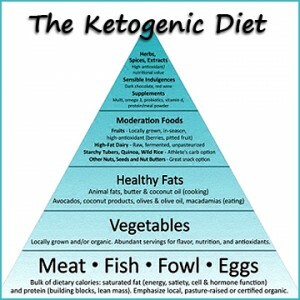 Where does protein fit into the ketogenic diet? 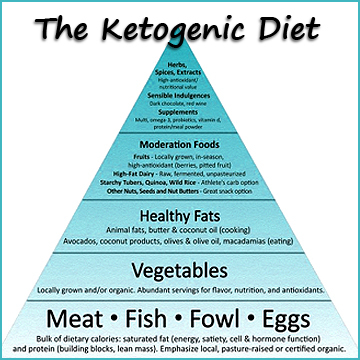 The ketogenic diet includes moderate amounts of protein, as excess protein is converted to glucose. Excess glucose increases insulin release and inhibits the body’s ability to burn fatty acids and go into a state of ketosis. With a ketogenic diet, it is not necessary to buy special foods. Whole foods prepared at home are the basis of the diet. Add more healthy omega-3 fats by eating wild caught fish or taking a fish oil supplement, and include saturated and monounsaturated fats such as full fat dairy, butter, olive oil, coconut oil, avocados, macadamia nuts and eggs. When possible, choose clean proteins such as organic or grass fed animal foods, which have a higher fatty acid profile. Choose non-starchy vegetables and greens and limit sweeter vegetables and fruits. Most would agree that the American diet needs to change in order to reduce obesity and related illnesses. The goal of nutrition should be to create health and discourage disease. With a ketogenic diet, in addition to weight loss and increased energy, you may have lowered blood pressure, better balanced cholesterol levels, a drop in fasting blood sugar levels, clearer thinking and more stable moods. A diet that contains less added sugar, refined and processed foods and oils, and more heart-healthy, brain-healthy fats may not only add years to your life but can increase the quality of life during those years. Alpha Lipoic Acid 400 mg by Pure Encapsulations – This multifunctional nutrient plays a key role in metabolic processes and provides potent antioxidants. ALA supports glucose metabolism, nerve health and cardiovascular function. Biotin-8 (8,000mcg) (B118) by Thorne Research – Biotin supports glucose metabolism and helps maintain already normal blood sugar levels. Biotin enhances muscle insulin sensitivity by increasing uptake of glucose by the muscle cells. Coconut Oil Organic Extra Virgin by Nutiva – This certified organic, non-GMO pure coconut oil is comprised of 50% lauric acid, an essential fatty acid found in mother’s milk, which has been shown to have health protecting properties. Cholesterol and trans-fat free. Made from cold pressed fresh coconuts. Enzyme Nutrition Two Daily Multi-Vitamin by Enzymedica – This amazing whole food supplement contains high potency enzymes, antioxidants, probiotics and daily botanicals in support of energy, immune function and overall health.